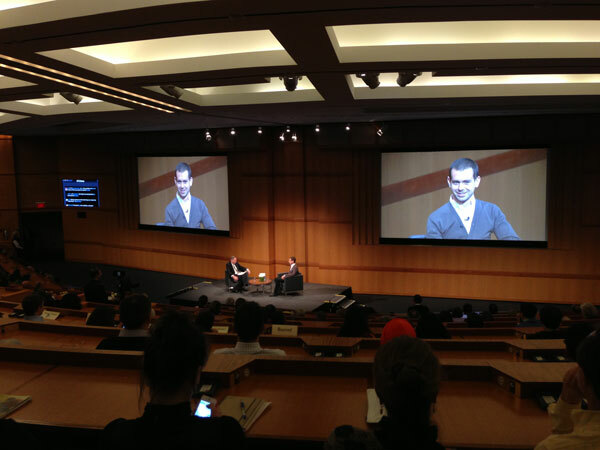 Jack Dorsey at Cleveland Clinic’s Ideas for Tomorrow Speaker Series. Last week I was honored to hear Jack Dorsey speak in an interview with Toby Cosgrove, M.D., president and chief executive officer of Cleveland Clinic, at the Clinic’s Ideas for Tomorrow Speaker Series. Jack is creator, co-founder, and executive chairman of Twitter, Inc. social networking feed and the co-founder and CEO of Square, Inc., a device which enables mobile credit card payments via iPhone or iPad. The one-hour informal talk gave us insight on Jack’s ideas that lead to Twitter, like an interest in mass transit and developing a means for emergency workers, taxis and couriers to communicate in real time. Jack’s early creativity included some formal training in art and design. He initially sketched ideas for Twitter’s process and Square’s user interface, and currently works at both companies, Twitter headquartered in San Francisco, and Square in New York City. The Twitter name went through some early word-smithing, starting as Jitter and then Twitch. Did you know that Twitter is still banned in Syria, Iran and China? I believe in the usefulness of Twitter and have been tweeting nearly five years now! According to Jack, only 8 million small businesses today can accept credit cards, and 26 million small businesses can’t. Square charges a flat 2.75% fee, which is less than most online merchant banks charge, and has created a huge opportunities for small businesses to use this product for their customers to make payments. I was at a holiday art bazaar a couple months ago and one vendor was using the Square on an iPad for customers purchasing their lama socks and hats. Square currently holds a lot of potential for money-less and hands-free purchasing, and he gave an example, using Square Wallet app linked to a credit card and GPS, of walking into a Starbucks and our face and favorite coffee comes up on the register and is ordered before we have even reached the counter! A push feature could ask us about a tip. We could just give the cashier our name, and leave our mobile phone in our pocket or our purse.